To understand the mechanisms underlying how Walleye are affected by other fishes, we will be conducting a multi-year experiment on McDermott Lake in northern Wisconsin. We will be removing as many bass and sunfish from this lake as possible beginning in summer 2018. These fishes are thought to be potential competitors and/or predators of Walleye, so by removing them we will be able to see if the Walleye population is able to recover, and therefore if there is an interaction between these species. Although the actual removal will begin in 2018, we began the project with a lake selection process in 2016-2017 and began collecting baseline data in 2017. Scroll down to learn more about the lake selection process, 2017 sampling, and see photos from the field. During 2016-2017, we gathered public and management input, surveys of fish populations, and removal cost assessments to determine the lake that would be best for this experiment. Through this process, we found that McDermott lake was the best candidate for the removal of bass and sunfish. McDermott Lake is a small (~100 acre) lake in Iron County, WI. Historically, McDermott Lake has had a self-sustaining Walleye population, but in recent years has experienced declining natural recruitment. Additionally, McDermott Lake has a rising population of bass and sunfishes. Given the public support and the fish community characteristics, this lake was selected as the experimental lake. We will also be monitoring a nearby lake, Sandy Beach Lake, with similar characteristics as a reference. We will not be removing any fish or making any changes to Sandy Beach Lake, but will take measurements to make comparisons between the experimental lake and the reference lake. More information on the lake selection process can be found here. From April 2017 through September 2017, we sampled McDermott Lake and Sandy Beach Lake. We gathered information on the Walleye population and the complete fish community through multiple sampling techniques, including night electrofishing, fyke nets, beach seining, and clover traps. We also collected information on other parts of the lake, such as the food for fish (macroinvertebrates, zooplankton, crayfish), plants, water chemistry, and temperature. Detailed descriptions of days in the field with additional photos can be found here and here. We estimated that there were ~45 adult Walleye and ~315 adult Largemouth Bass present in McDermott Lake, but we did not find any evidence of natural Walleye recruitment. The fish community of McDermott Lake was dominated by small sunfishes, particularly Bluegill and Pumpkinseed. 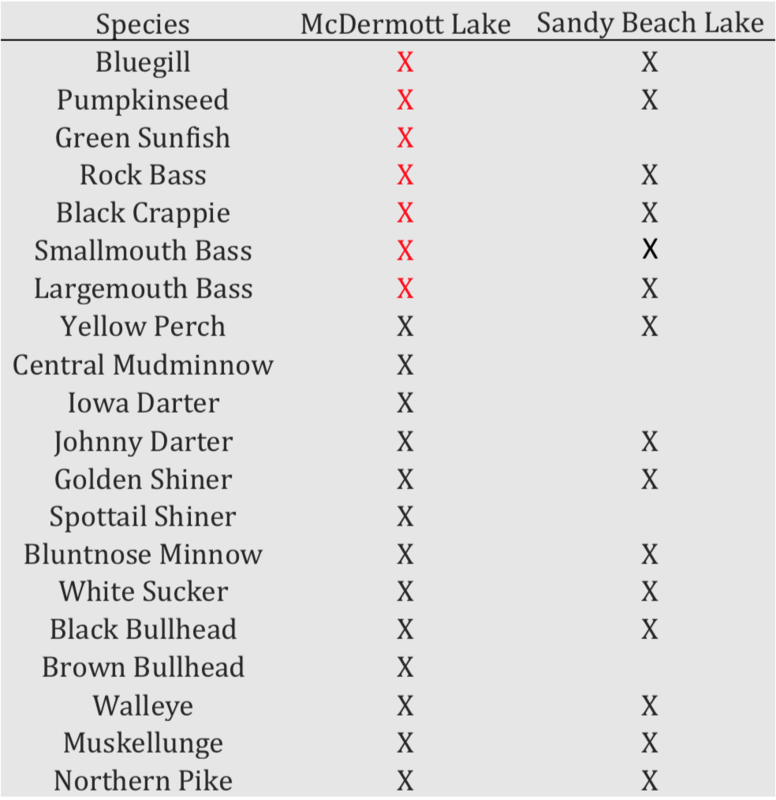 Species present in lake are shown with an X, those species that will be removed are marked in red. * Feel free to contact Holly Embke (hembke@wisc.edu) with any questions about the experiment.